Thursday, September 11, 1980—got up early and worked with the dogs, getting in some training. Helped at the garage until afternoon, then built a stove and a tub to heat water out of a 55-gallon drum. I’m going to heat my hickory lumber for the sled runners to get a bend in them at the front. Then when that’s done, I’ll boil and dye traps in the tub for trapping this winter. Saw Charley T. for a while today and Sylvia. Friday, September 12, 1980—boiled the hickory sled runners all day and worked at the lodge. Made a form for the runners and went and got Sylvia. Saturday, September 13, 1980—finished steaming the runners. The wood was so dry, it was hard to get them to the point where they would bend. Possibly I boiled them too long. Then I boiled the traps in dye and fixed the tire for the trailer for the swamp buggy. Waxed the traps, and it’s raining. Did laundry at Mendeltna and visited people there. Then I took my swamp buggy up another creek and trail. I came across another swamp buggy that had gotten badly stuck. They pulled the winch so tight that they couldn’t get the cable loose. I had to pull them ahead into the swamp farther so that the cable could be loosened and get if off of this tree and pull them out of the swamp. Then I had the winch to work on. They were hunters going out moose hunting. Sunday, September 14, 1980—went to Dennis and Sally’s cabin on Tazlina Lake. Pretty nice cabin. I also went to look at Bob Schmidt’s cabin on the same lake, then Sylvia had to go back to work at Gunsight, so I took her over there. I came across Ray Kole’s. His machine was broken down and he had two other hunters with him. I took him and these other fellows back to Gunsight and then went home and worked on the dog sled. Monday, September 15, 1980—bent more hickory for the dog sled and sighted in the .338 rifle. Did cabin chores and started getting gear together to fly out in the bush to hunt and look for a trapline cabin site. 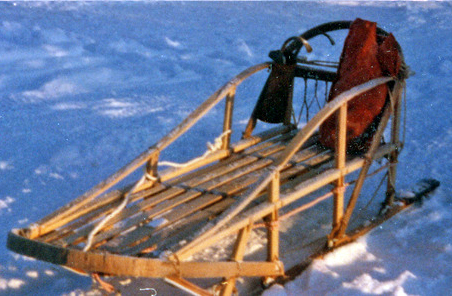 Tuesday, September 16, 1980—bent more wood for the sled and got laundry dry. Went to Dan’s with my gear and he flew me over lots of the area looking for trapper cabin sites. Landed me at Nye Lake. (I plan to hunt moose and caribou here). Got my tent up and made camp. Wednesday, September 17, 1980—got up early and went out. Came close to a bear that was feeding. I heard him first and backed away. Saw over 20 caribou, but nothing nice or in range. Saw two caribou bull fights, saw an owl and spruce hens and two eagles. Dan flew over to check and see that I was all right. There was a beautiful sunset, and two moose fighting at that time. Thursday, September 18, 1980—I saw three caribou a quarter mile from camp, but they winded me and left. Saw some loons on this lake and a few duck, and a real pretty hawk. It’s very windy, though nice in the sun. Walked quite a ways today and discouraged tonight. There is lots of bear sign in this area and I’m not getting any hunting done with game so scarce. Friday, September 19, 1980—got up early and went out hunting. Ran into a fella (Bill) who was looking for another guy that was lost. I showed him the area where I was camping and hunting and where I’d heard a bear and they checked all that out and didn’t find this man. Scott, Chris, Henry and Dan flew in. Scott wanted to stay and hunt, so he and I went hunting. We didn’t have any luck hunting, but I found a place that I think will be a great spot to build a trapper cabin. I like the country there. This entry was posted in Journal Entry and tagged 55-gallon drum, boiling hickory, Mendeltna, sled runners, Tazlina Lake. Bookmark the permalink.